Australia’s favorite orchestral art-rock band has returned after a few years of on-and-off touring with their latest collection of experimental pop songs, The Revolution is Never Coming. 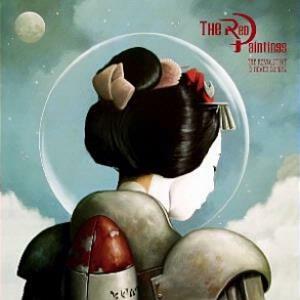 The Red Paintings are known for elaborate and unpredictable stage shows, including crazy outfits, props and live painting demonstrations, usually using humans as the canvas. The challenge for any such band is conveying that spirit through the music alone or otherwise preparing the audience for what to expect. In that regard, Revolution succeeds. It succeeds with bizarre imagery, unpredictable changes and layers and impassioned vocals courtesy of the band’s leader, Trash McSweeney. Revolution begins with a proper introduction: a gradual lead-in and backwards loops on “Vampires Are Chasing Me.” McSweeney’s loose, wide and stifling voice is often expected in bands more in the vain of Korn — as you expect him to burst out in a scream at any moment. He does not, not when you expect him to anyway, and that’s refreshing. Even though second song “Dead Children” starts with some yelling, it’s just for the purpose of the lead-in. First single, “Wasps,” mixes electronic beats with doom-like riffs, which serves to fill out the sound, and when McSweeney does indeed raise his level on this song, it’s effective instead of obligatory. The Red Paintings don’t need help from electronics to create a full sound. Revolution features a 35-piece orchestra and a 22-person choir, which provide the tools necessary to create an Asian-style sound in “Hong Kong” or accomplish wide dynamic ranges such as in “The Fall of Rome.” The beauty of this band and this album in particular, though, is that even with all of these haughty elements, it remains accessible thanks to McSweeney’s engaging melodies and vulnerable Reznor-esque vocals. The Revolution is Never Coming was five years in the making, and that care is evident in the compositions throughout. One can imagine that every song was crafted with its live counterpart in mind. The Red Paintings are on tour now, so if you want your concert-going experience to be an experience instead of merely a performance, check out this album and go see them at a venue near you.